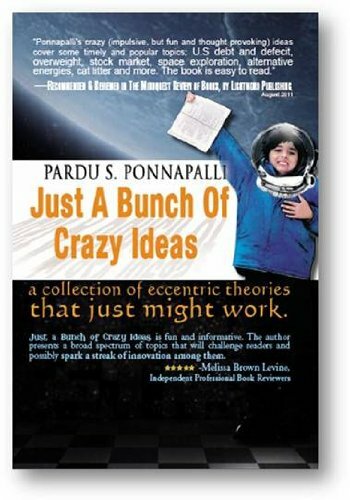 The purpose of this book is to share a bunch of “crazy” ideas. There is no claim that any careful research is done. It is more like a brainstorming session where any idea that comes to mind is presented. That is why you get a wide range of topics , from dealing with cat litter to exploring space. You may wonder what the value of this is. Maybe the ideas are all not worth much in practical terms. Or perhaps there are some gems and some real bad ones. What’s the sense in me writing about these ideas? Actually, I was wondering the same thing for many years. I have thought about writing this book for a lot of years , and never went through with it until recently. I think we all start out when we are young thinking we are going to change the world. Especially in university, when I was studying physics, I had constant discussions with my colleagues about revolutionary ideas. As you get older, you settle down to a regular life that for the most part involves paying bills with the money you earn. Most of our energies start getting devoted to survival. Before you know it , you are wondering about managing retirement and you are left with a sense that somehow life passed you by. The reason for this transformation from a wild eyed youngster with grand ideas to a well settled mortgage paying robot is fairly plain- most of us are just struggling to get by in life. Few of us have the luxury of picking and choosing what we do for a living. My own entry into the IT field was due to the inability of finding any physics related employment after doing a Ph.D. The job market was poor, and I looked around for a marketable job. I have done fairly well in my chosen profession, but I am constantly haunted by the thought that I was meant for something else. I suspect I have a lot of company in this regard. People will think they are stupid (a perennial favorite). I bet someone has thought of it already (yes, but they might not have voiced it ). I want to stick to the safe stuff that’s in the realm of my expertise. It all becomes a tedious cycle. We end up doing something by rote, or maybe finding just a few ideas in our chosen profession that are interesting, and being content to live out our lives without a sense of wonder or exploration. So this book is my attempt to revive a sense of wonder and speculation. one paid title on Kindle Nation. We encourage you to support our sponsors and thank you for considering them. Despite her a life of privilege, Sylvie can’t seem to give her husband, Gerald, her whole heart. She feels broken until she falls for Nikos, the Greek handyman. Pregnant with Nikos’s child, one she knows Gerald won’t accept, Sylvie switches babies in the hospital, a desperate move with generational consequences.